The Remembrance Day services and parades around the country were of course of greater significance this year, commemorating one hundred years since the end of the First World War. In Wirksworth and Middleton, all who served in the Great War and those who endured the war at home, were remembered in a unique commemoration of the ending of the conflict, and one which recreated events of a hundred years ago. Then, over 120,000 headstones for graves of those killed were made in Middleton, from Hopton Wood stone, and sent to cemetaries in Belgium and France. 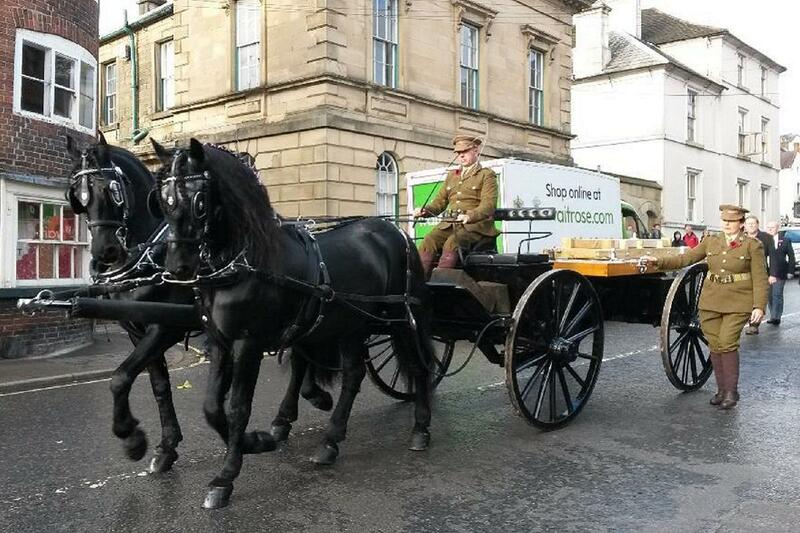 Three replica headstones have been created and engraved to mark this anniversary and one of these was taken by horse-drawn gun carriage (pictured above), first to the Remembrance Day Service in St. Mary's Church in Wirksworth, then in procession to the Memorial Gardens, where a wreath-laying ceremony was held. President Pam laid a wreath at the War Memorial on behalf of the Wirksworth Rotary Club. Our club is very proud to have been invited to take part in the parade and we were pleased to be able to provide marshalls to help control the traffic during the procession.